We were really busy because it was the last week of the transfer. We did get a transfer call….. and all three of us are transferring together to Gokiso! Its a really weird transfer call but we are really excited to stay together. We are sad about leaving Takabata though because no more sisters are going to be there. It will just be four elders. I’m sad because I only got 4 weeks in Takabata total. On Tuesday Sister Nakamura and Sister Konno had to go to Trainers Training Meeting but since I am not a trainer or a bean, I didn’t have to go. The meeting is in Meito so I got to go with Sister Papenfuss and Sister Murakami for the day 🙂 It was a lot of fun, we went and made a lot of appointments with people and we were able to meet with some really nice less actives. 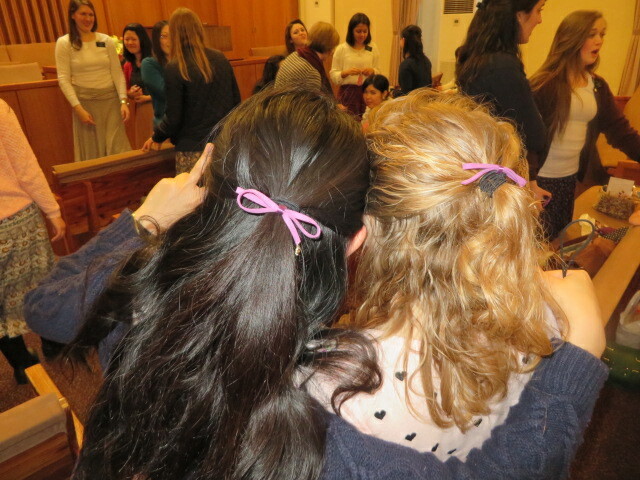 We also had a Sisters Conference this week! It was so much fun! All the sisters from the mission got together. 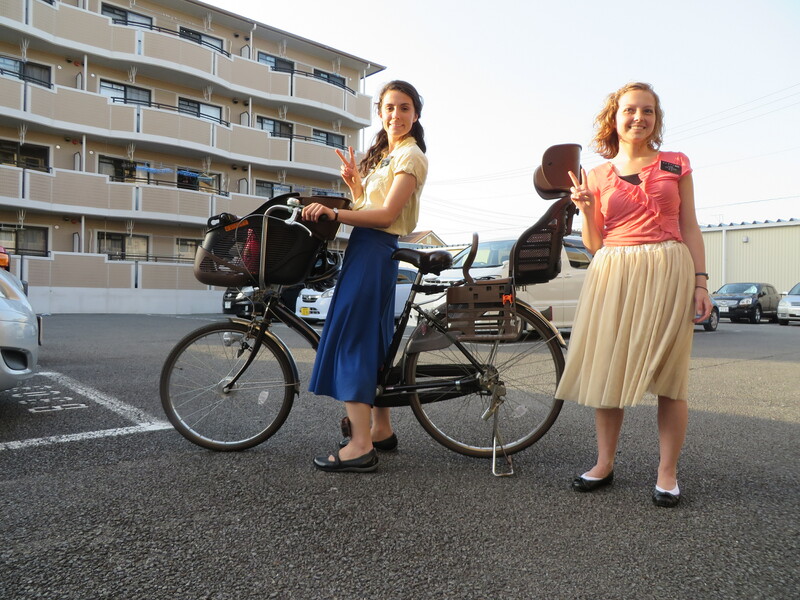 We first had a really spiritual message from a sister who served in Japan and now lives within our mission. She had a goal to baptize 55people every week! She baptized hundreds of people, in Japan! 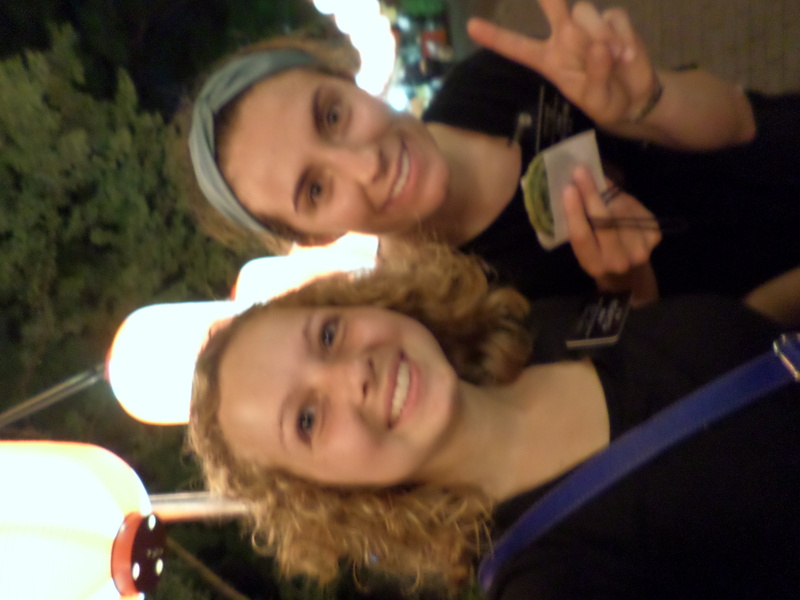 It was really cool to hear her speak, she gave us a lot of advice about missionary work. Then we had a talent show. Sister Papenfuss and I played “Come Thou Fount of Every Blessing” together. Yesterday we had a really a good lesson with one of our investigators. Last year her mother passed away and so we taught her about the Plan of Salvation and how though the gospel they can be together again. We had her lesson a restaurant right during the lunch rush. The cool thing that happened was, none of us even noticed because we felt the spirit so much and we felt so focused on this lesson. 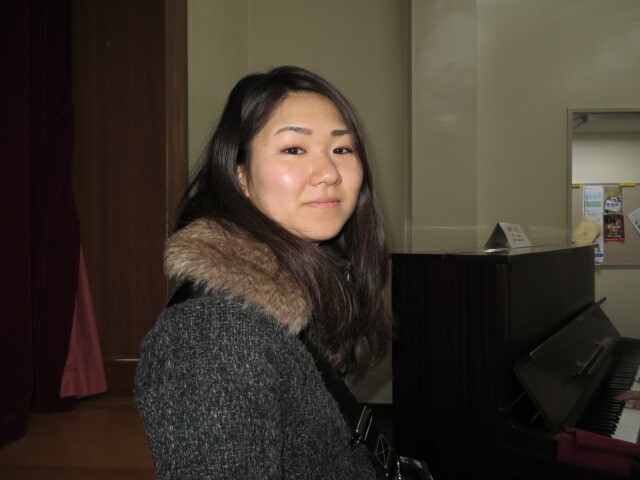 At the end of the lessons sister Konno invited her to be baptized. She told us that she doesn’t know if this church is true or not yet. We testified of the truthfulness of it and invited her to pray about it. I have a really good feeling about her. She is really awesome and she always asks us the best questions. 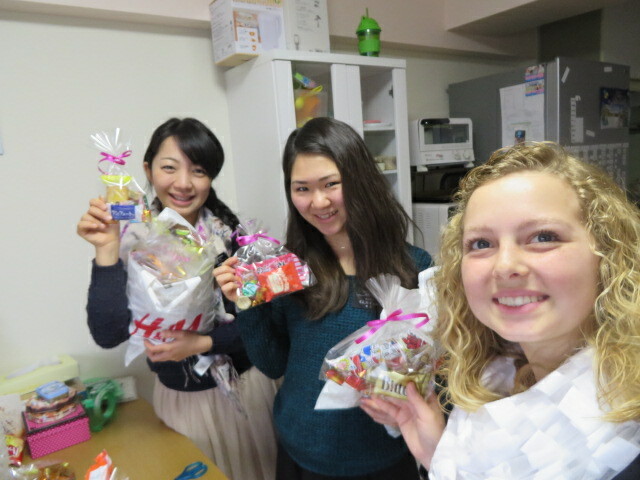 We have a party that we are going to that is for the New Year. You’ll think this is funny but one of my favorite foods is shirasu, its a little fish, see if you can find a picture. 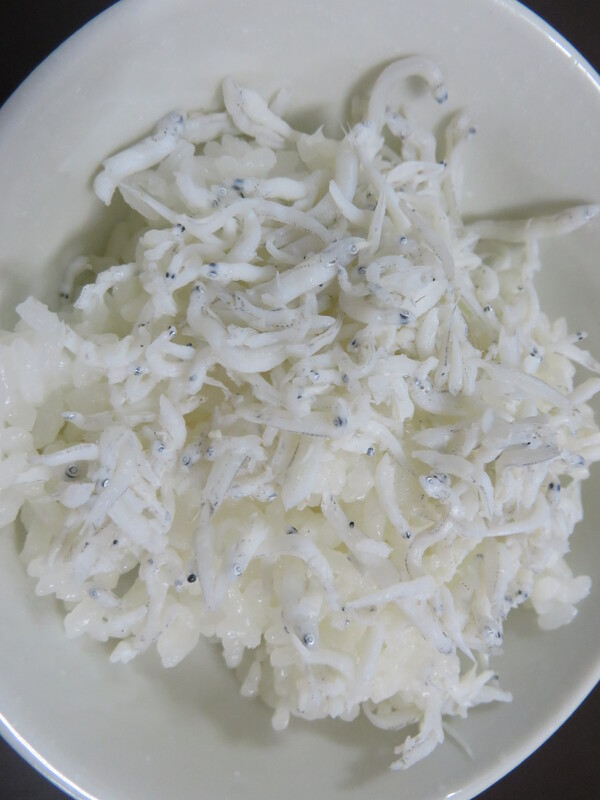 I eat it raw with rice and soy sauce for breakfast, and miso soup;It tastes just like string cheese.Its also really good in a rice ball with tuna fish. I eat sea food every day almost, I eat shrimp everywhere haha. 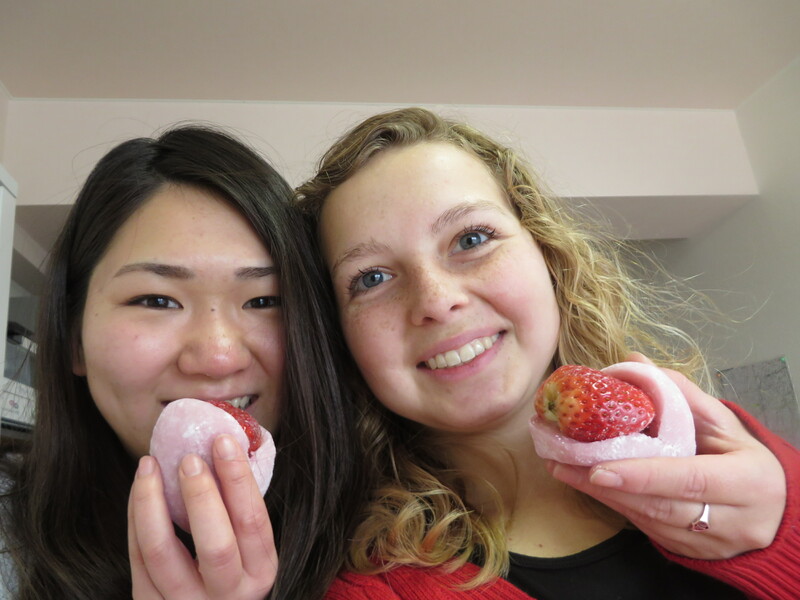 Its Mochi, strawberry, and Anko; its called a Ichigodaifuku. Aubree and her new Companion Papenfuss Shimai eating ice cream. 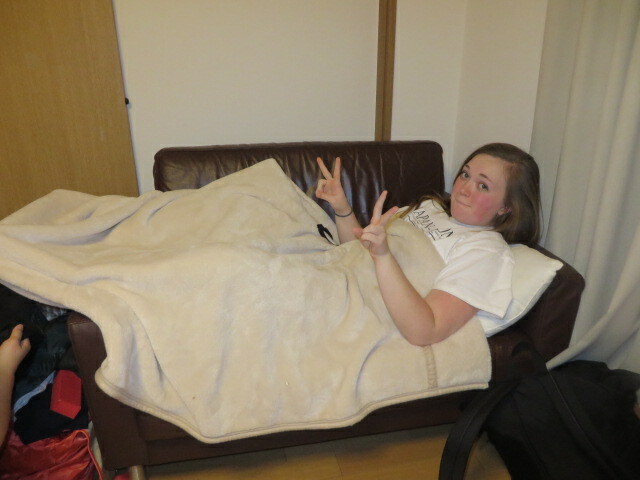 Since Ward shimai was transferring she had to do a lot of packing on last P-day. The people who pick up her luggage showed up a half hour early so we just started stuffing things in her bags. We got it all sorted out 🙂 Then we went out to dinner with this grandmother and her two grandkids. They come to Eikaiwa every week and they took us to sushi. We went to Nagoya and I got my new companion Sister Papenfuss. She is half Japanese and grew up in America. She has been speaking Japanese her whole life so she is fluent, which is a really big help. 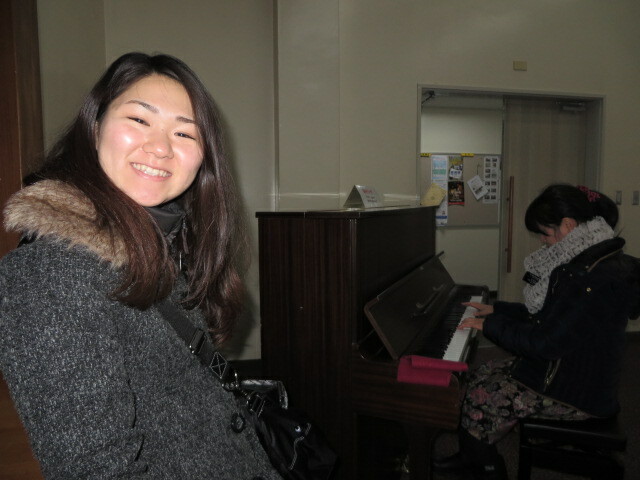 She is super awesome and is majoring in Piano Performance. 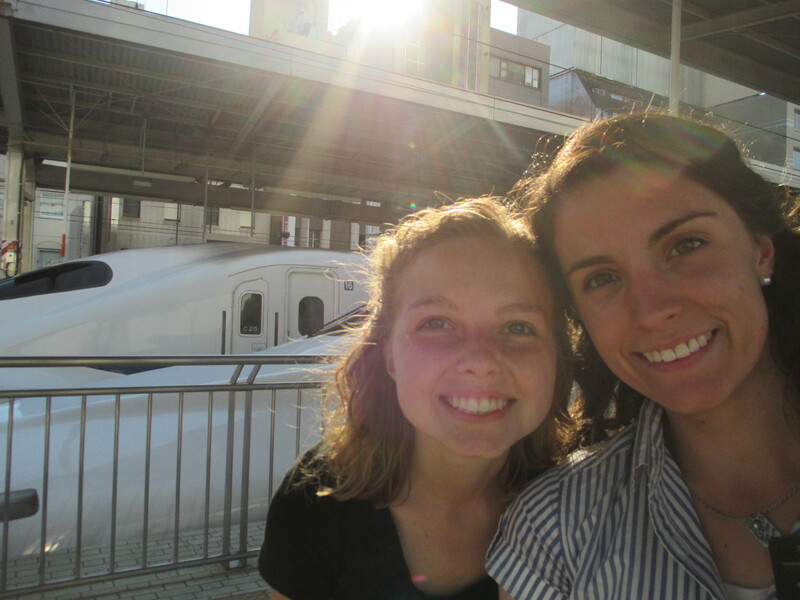 We got to take the Bullet train so that was pretty fun. That night when we went to leave for a lesson, we realized that sister Papenfuss’s bike had a problem. It was like the brakes were staying on part way. 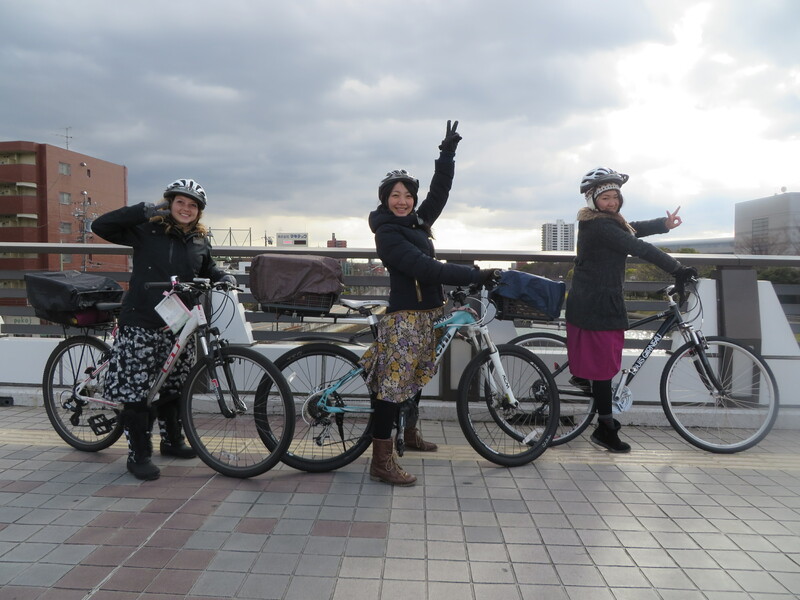 Thankfully we were able to borrow one of the Elder’s bikes and make it to our lesson. We got sister Papenfuss’s bike fixed in the morning, they just put on new brakes for her. Then we went and visited our investigators the Tomitas. We have been teaching them the plan of salvation recently but I’m not sure if they understand it completely yet. They like to come up with really hard questions to ask us. We have been trying to use the scriptures a lot to answer their questions. We visited a lot of less actives this day. One of them is the Sato couple. The wife is Filipino and the husband is Japanese. The husband is really into music and playing guitar so we invited them to come to church and hear our musical number. We tried calling Watanabe shimai earlier in the week to make an appointment but he phone told us that it wasn’t working. We went to her house this day to check on her but she wasn’t home. 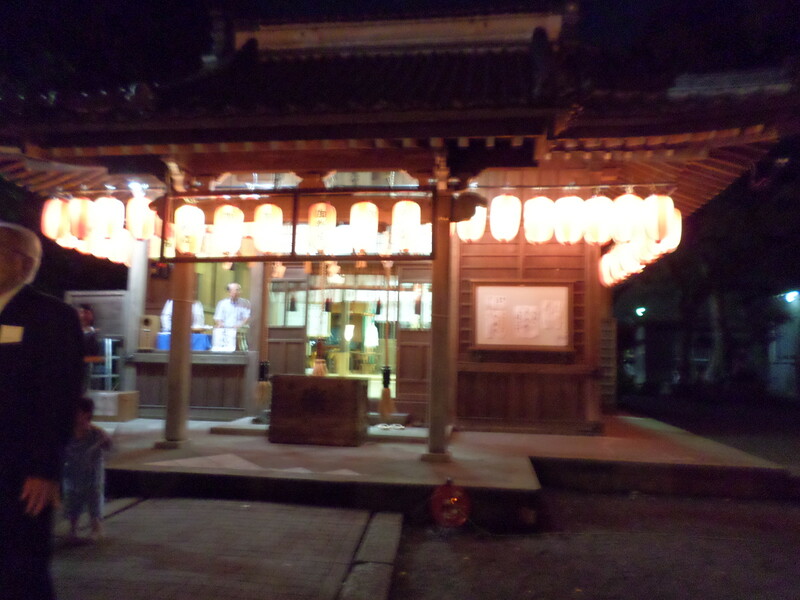 We went to Watanabe shimai’s house again and found out that she had bought a cell phone and canceled her other phone. She also had no idea how to use her phone so we taught her how. A member from another ward came and took us to dinner this night. They were taught by sister Papenfuss’s dad actually. So it was really cool to hear the story of how they were converted. We had a really good lesson with our investigator Nakayama san about repentance. We talked about our it is how we change and become better people. We also invited her to think about baptism. At church Sister Papenfuss and I played a musical number “Love is Spoken Here” and it went really well. These little fish that you put on rice. This week was really good. On Tuesday we did a bunch of OYM. We talked to 20 different people. We started talking to these two grandmas and one of them gave us some cupcakes! People here are so nice to us. We went to a park that is in the city to do the OYMing while everyone was on their lunch break. After we had planned to sit on a bench and eat lunch. About five minutes into sitting there we had so many bug bites. Ward shimai got 16! We just moved to another part of the park and it was all good. Video is a view of the city. The weather here has been so pretty this week. It only really rained hard once or twice. On Saturday morning it was dumping until we needed to leave. It was really awesome that we didn’t have to use our Kappas. When it rains here it is still hot, so when we put on our kappas we just feel all sticky haha and it isn’t even as hot as its going to get! 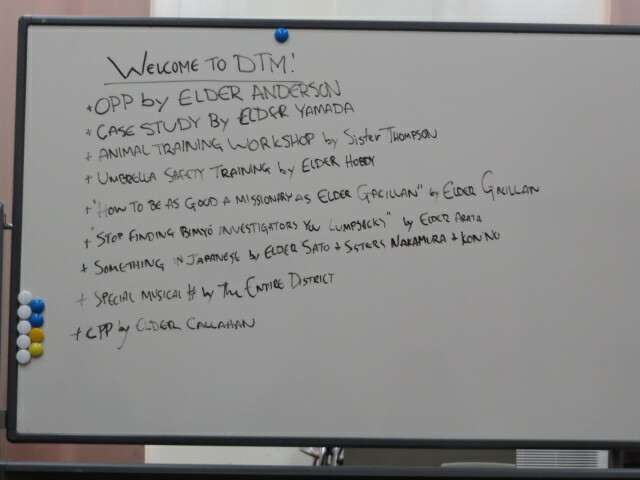 We had another lesson with our investigator who is getting baptized in August. She is doing so well. We have finished teaching her all of the lessons that she needs before baptism and filled out the paper work with her. Now we just have to wait till August. We would like to move up her date but she thinks it would be too fast, so we are just going to have to wait. She is so awesome, yesterday at church she started making friends with all the members. 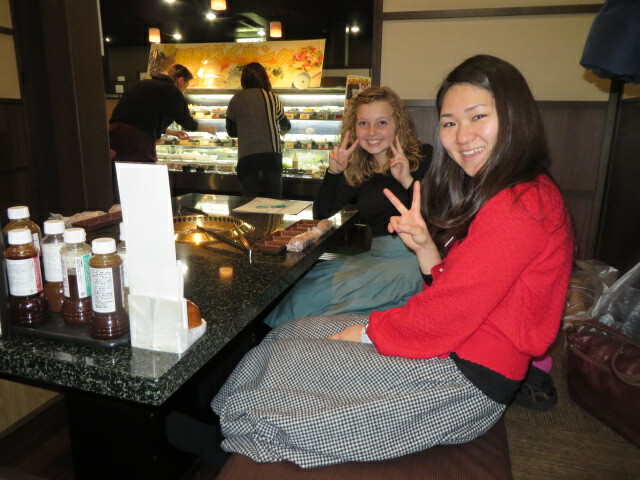 On Friday after district meeting we went and ate Shabushabu. Its basically a pot of boiling liquid that sits on the table and you put meat and vegetables in it and it is really good. Yesterday we had an appointment with the Stake president. They fed us dinner and then we had a lesson. They had us over for three and a half hours! It was so long, but they just wanted to keep talking to us. It was really fun. This week we get to have interviews with Yamashita kaichou, so I am really excited for that. So on Friday we made homemade root beer. It was sooo good. 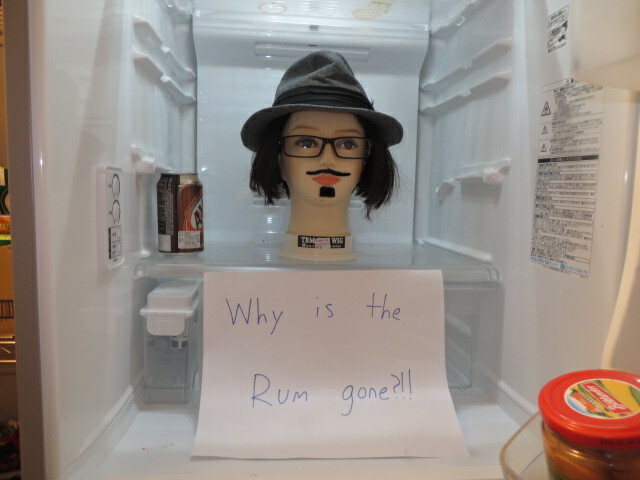 They don’t drink that here! 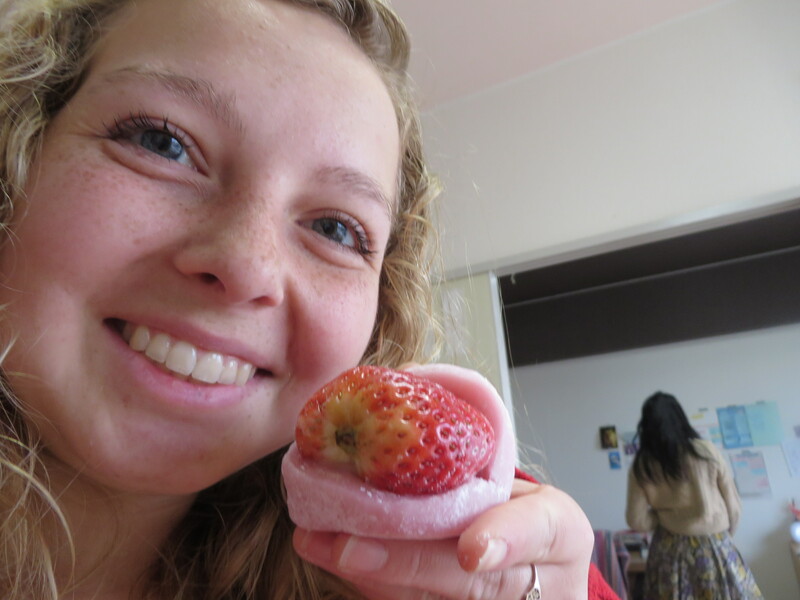 We had it at Eikaiwa and all the students thought it tasted like medicine. 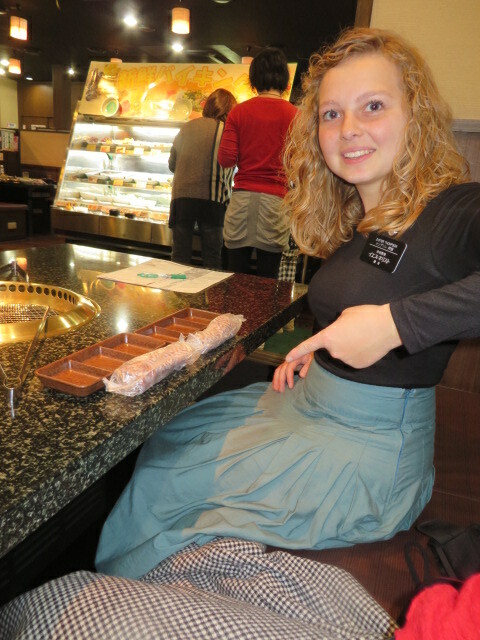 haha well the missionaries liked it. I think I have everything I need right now 🙂 I made the chocolate chip cookies for our district meeting and all the Elders played rock paper scissors over the last one haha. We have some food storage, and we just went shopping this morning. 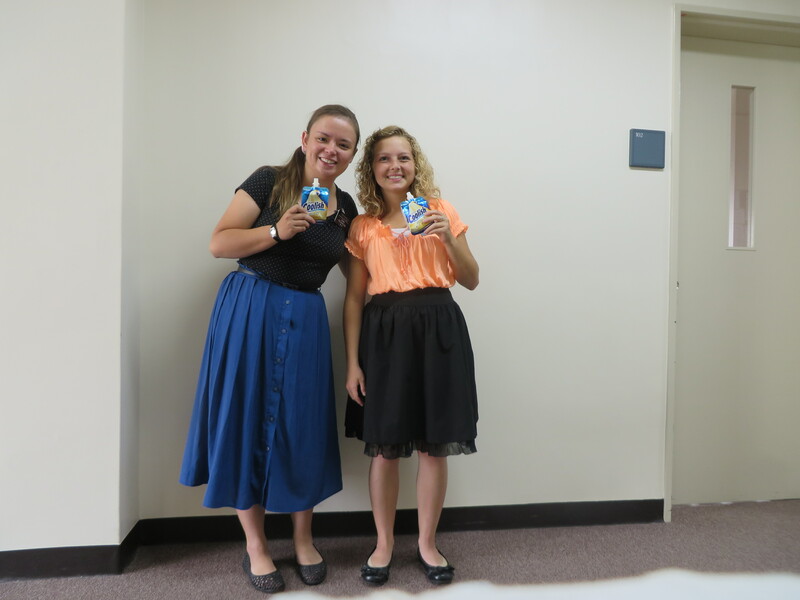 Also on fast Sunday the ward members give us a ton of food. We are going to go eat Indo curry and then I am going to look for new shoes because the black ones need to be put out of commission. I’ll try to find a few pairs. My size is the smallest adult size here, so I don’t even have to buy kids shoes. I am on the first memory cards still but I am taking lots of pictures and some video. I like the picture quality best (of the Cannon Camera). I carry the selfie one (Samsung Camera) with me every day just in case I find something cool to take a picture of( its smaller) but if I know I am going to take a picture I use the Canon. My bike is doing perfectly well now. 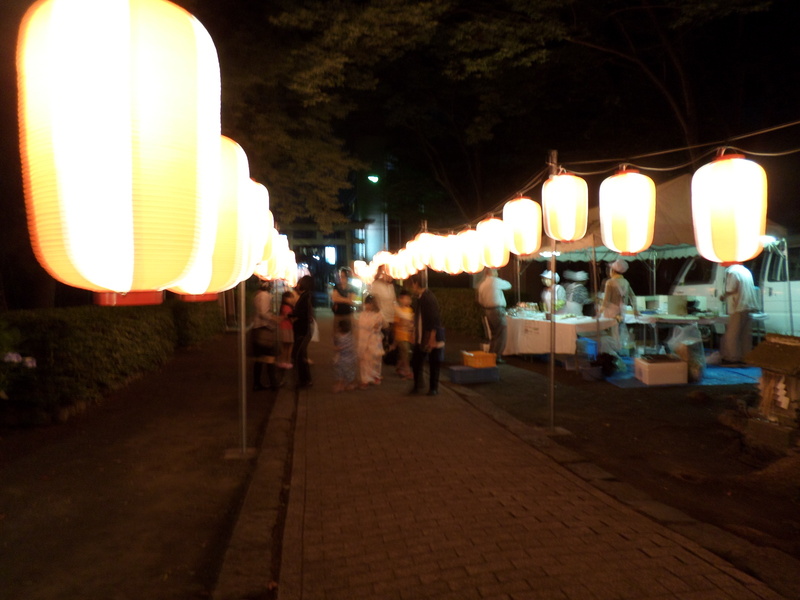 I just emailed a few pictures to mommy that are from this festival that they have here. 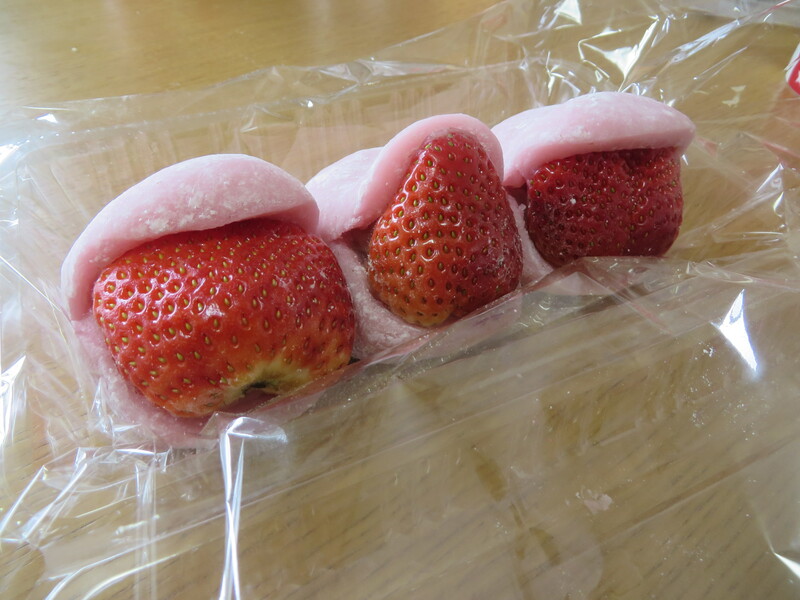 It is so that you are healthy in the summer. Our church is just two blocks; we walk there most of the time. Festival that focuses on being Healthy. Aubree’s dad emailed the Mission Home in Nagoya about the Storm that was headed their way, this is their reply. The Tropical Storm so far in Nagoya has been just a minor “off and on” rain storm and is getting weaker as it moves to Shizuoka. But the missionaries were told to stay in their apartments today. Hope this eases your concerns. This week has been really awesome! We were able to teach a lot of people. 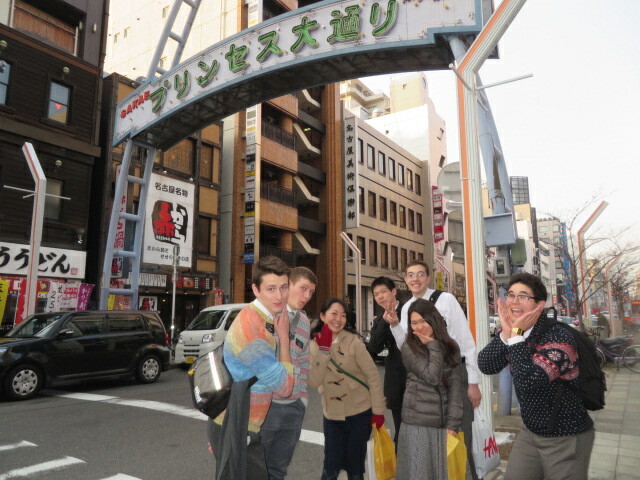 On Tuesday we went to Nagoya for trainers training. We got to hear from President Yamashita and get some really good advice from him. He told us to be an Ammon like missionary, we need to serve the people in order to be able to teach them. 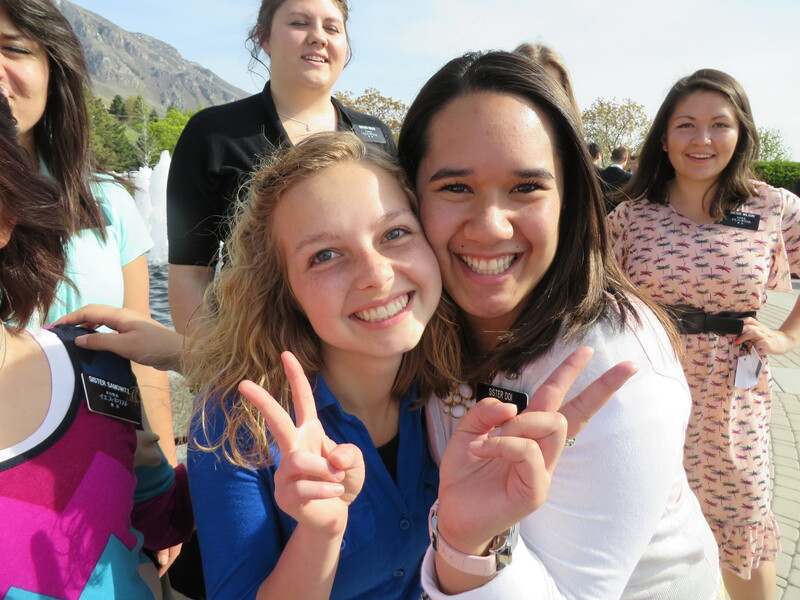 It was really fun seeing my MTC district again too. 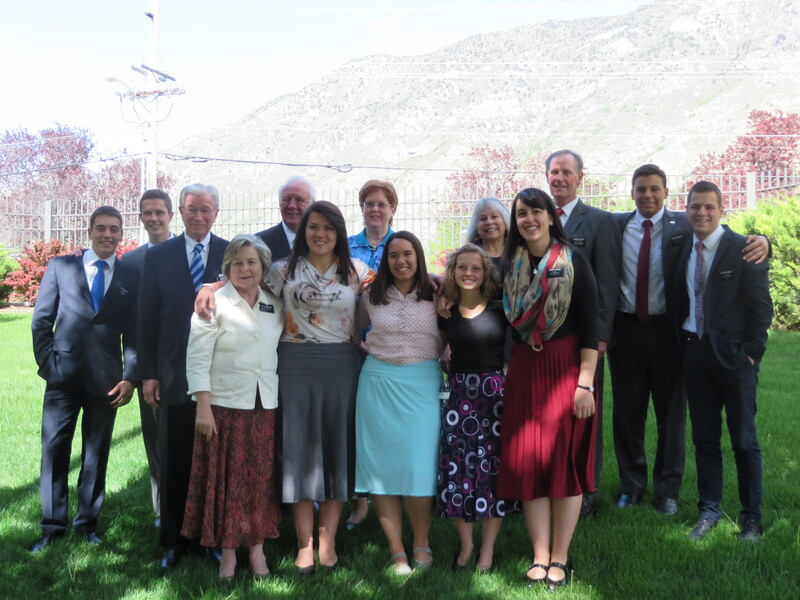 Aubree and the members of her district from the MTC who went to the Nagoya mission. Then on Thursday we had four appointments. 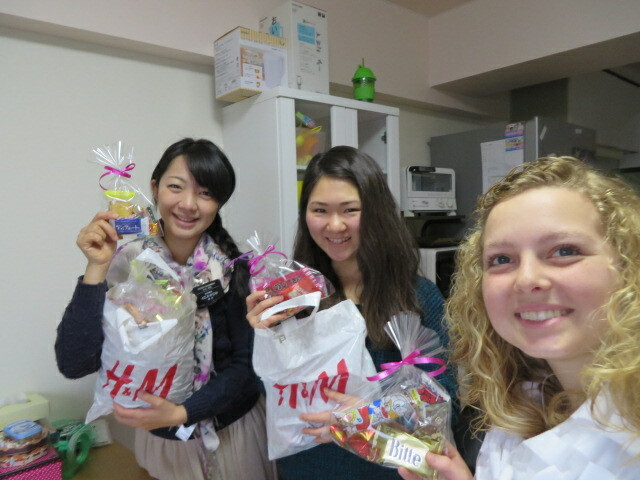 One of the members here is from South Africa and we meet with her every week and do Mogi(role play) lessons in English. Its really cool to be able to practice teaching in English so that I don’t have to worry about knowing how to say things, just about teaching. One of our other appointments was making Takoyaki with our investigator Tsukika chan. 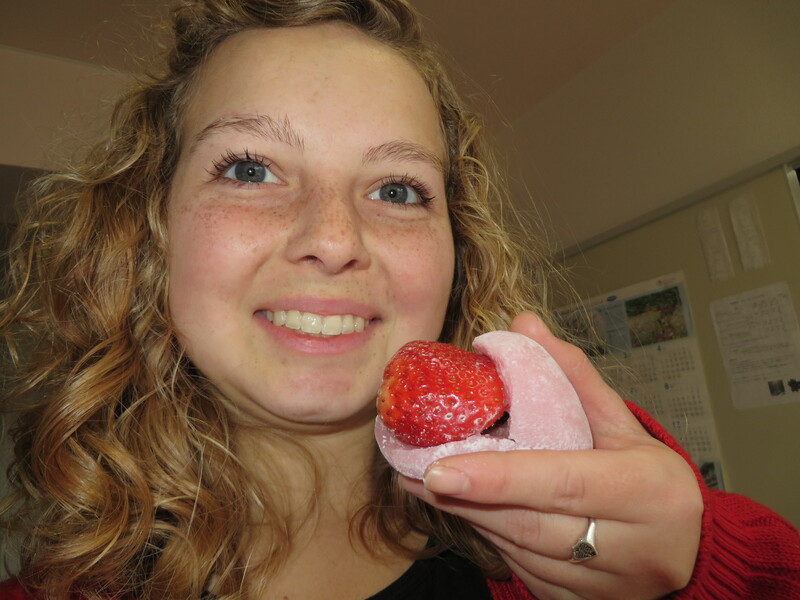 It was really fun and I actually like eating Tako now, I think it is almost better raw haha. On Friday we had Zone Training meeting. It was really good we learned about how we need to use members more to get referrals. We also started this 40 day fast thing where we give up something for 40 days so that we can be able to feel the spirit more, they might be good things but they distract us from being completely focused on missionary work. 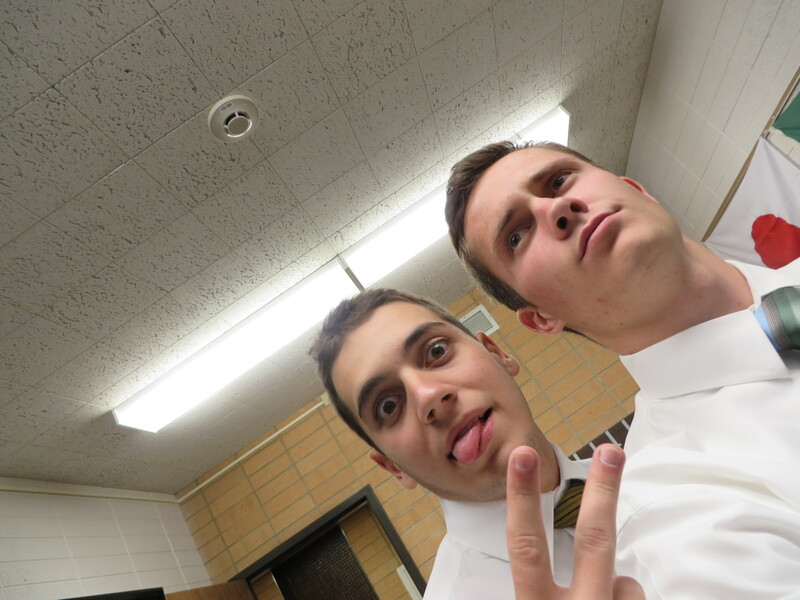 On Saturday and Sunday we had Stake Conference and it was really good. 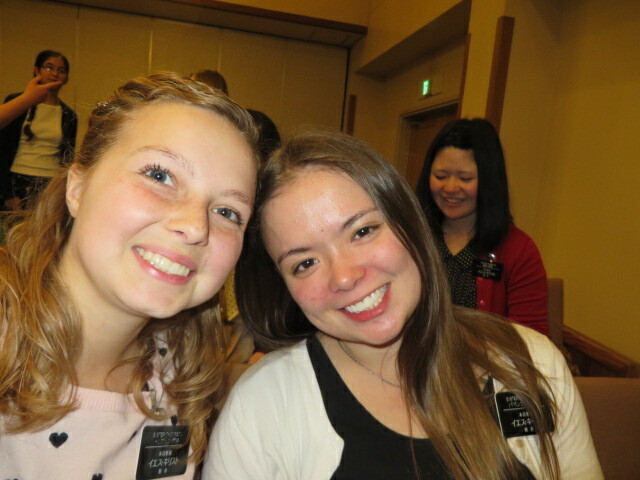 On Saturday we met with our investigator who is getting baptized in August and she testified to us of how reading the Book of Mormon changes your life and how much she loves reading it. It is so amazing to see how prepared she is, I feel my testimony grow every time we visit her. 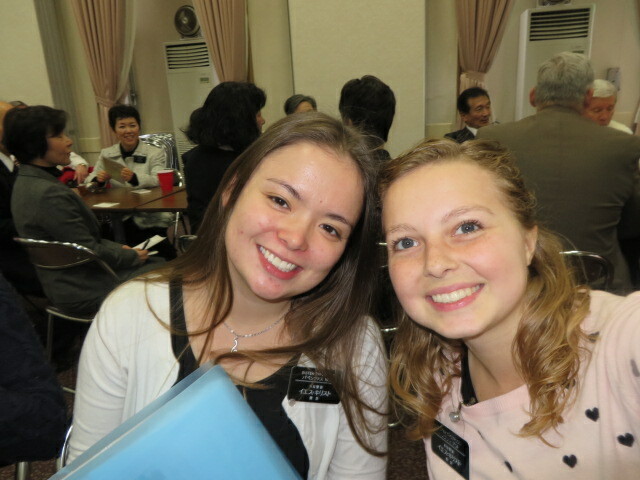 The Stake Conference on Sunday was broadcast to all of Japan, Elder Christofferson spoke and it was really good. Afterward we were able to show our investigator the baptismal fount and she thought it was really cool. This week was really great and next week is going to be even better! 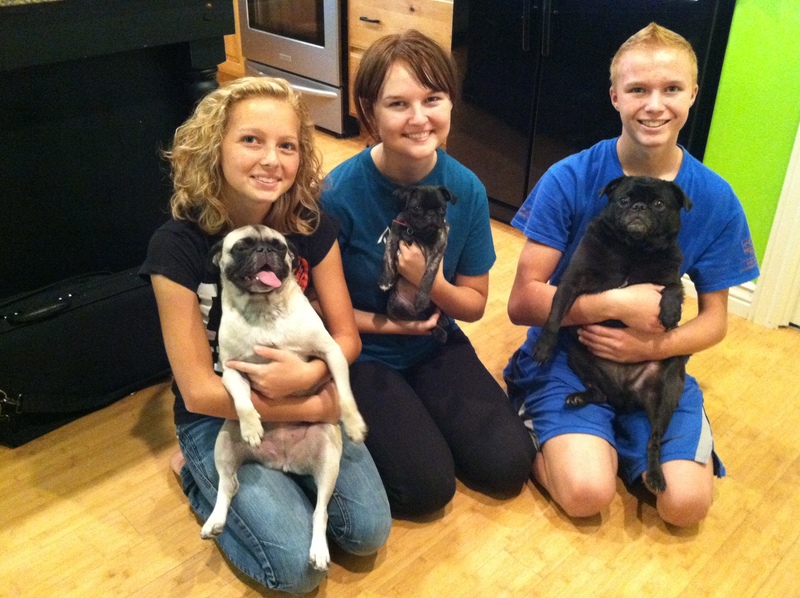 Aubree is holding Lyla, her sister Ashlynn is holding Olive, and her brother Jaden is holding Vader. We got my bike on Wednesday and it works great. I ate raw octopus and liked it better than cooked octopus. Its not super rubbery either way I didn’t think, it just has a better flavor raw. 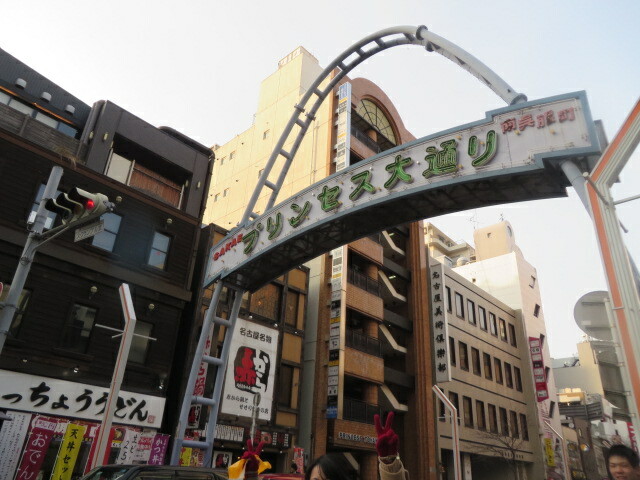 Today we are going to go eat Shabushabu and go shopping. 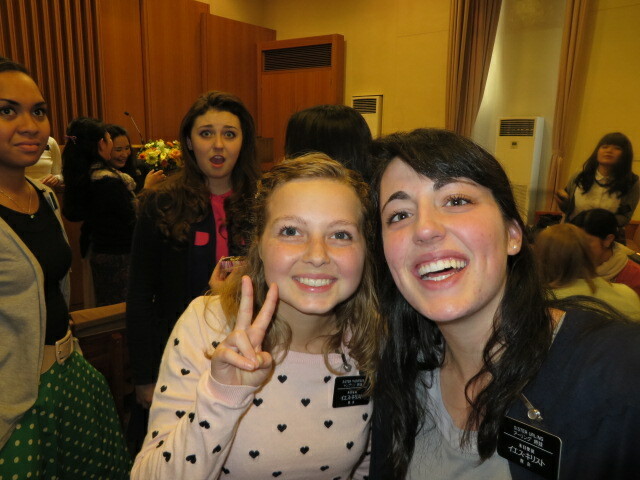 We had Zone training meeting and two of my kohai are in my zone, and one is in my district.They are one transfer behind me, so we were in the MTC together for 3 weeks. Schmeil Choro is still here, his companion got transferred to be a Zone leader in Okazaki. 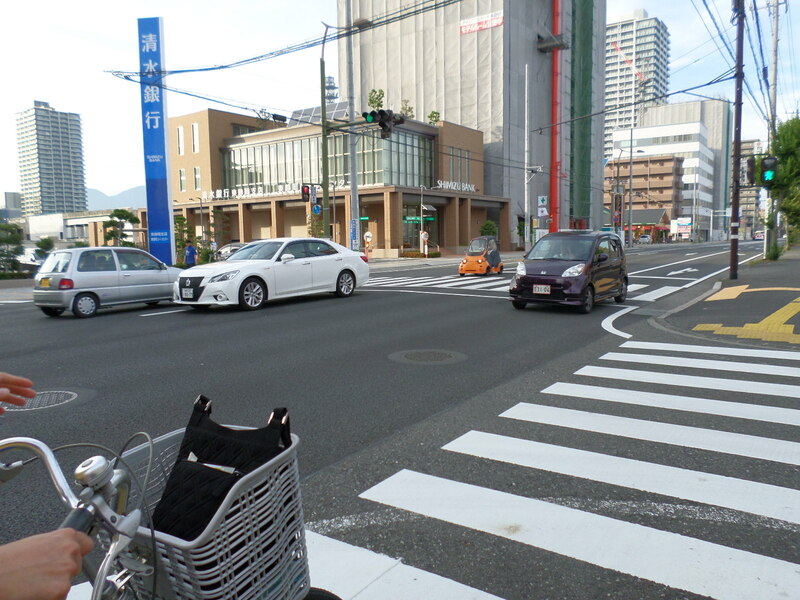 This is Ward Shimai’s 4th transfer in Shizuoka. Its really easy to buy clothes here for my size, actually I have to get a size 2 not a 0 here. Yes my bag is doing awesome and I found out that is in water proof haha. It doesn’t really rain too much here, like once a week which isn’t bad. It also rains a lot during the night. Everyone from my old district is doing really good, Urling Shimai is doing awesome she was really happy. My first week in Japan has been awesome! I am in Shizuoka and my companion is Sister Ward. 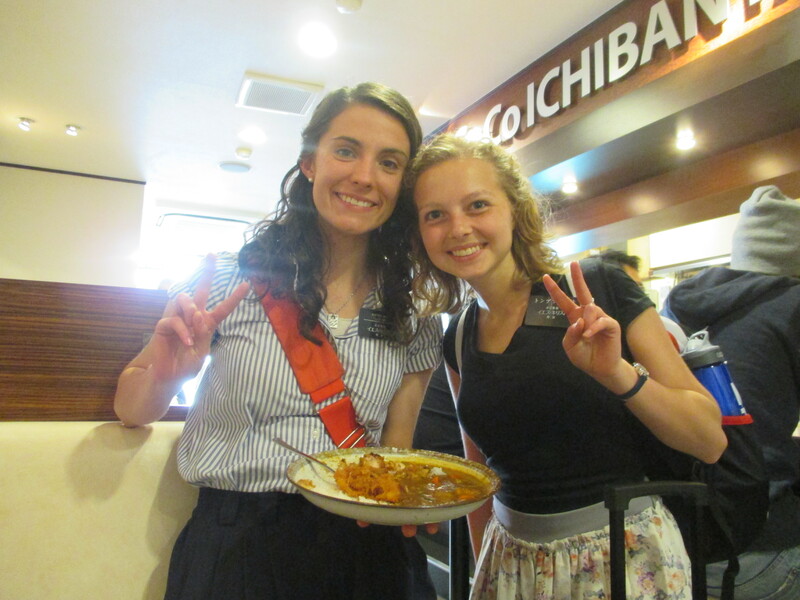 This is Aubree and her first companion in Japan Shimai Ward. I really love this area. 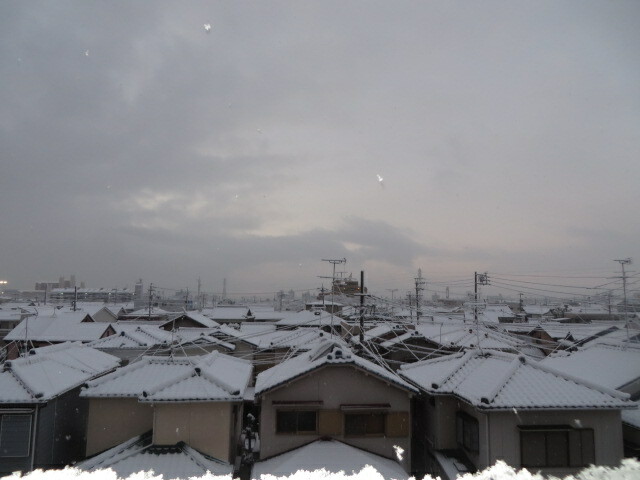 We can see mt. 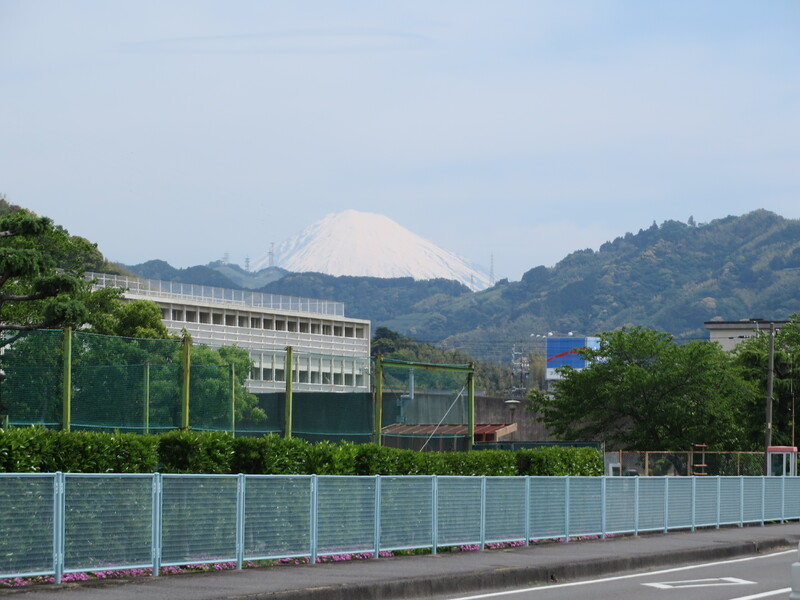 Fuji from my area. We have been having such a good time teaching people. On Sunday we had a baptism! It was so cool! The woman who was baptized is 84 years old so she is super cute! She is so nice 🙂 She speaks kind of different Japanese so its hard to understand her but she is super sweet! We went to her house on Saturday and taught her again. Aubree and Ward Shimai at the baptism. 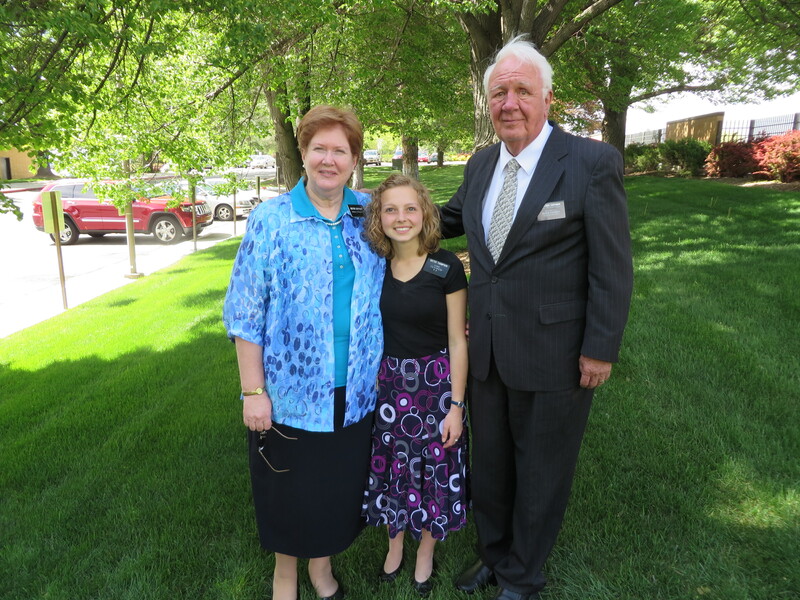 Aubree, Ward Shimai, and the Elders at the baptism. Yesterday we had a really interesting lesson. We had been talking about how we can be with our families again after this life and that our spirits don’t die. Then the investigator told us that she had a friend with a special gift, and she can see spirits. She goes on to tell us that she tries to call the spirits everyday. This investigator is really Buddhist. It was really interesting. We can tell that she is really looking for truth so we are really excited to teach her more. I really like her, she is really nice. We are going to meet with her again next week. All of the church members here are so nice! They are really awesome. Every time I meet someone here they like to compare their height to mine because I normally am smaller. We asked for her address, we wanted to look it up on Google and see where she lived but her address is in Kanji! It has been good, I felt down once but it wasn’t bad. 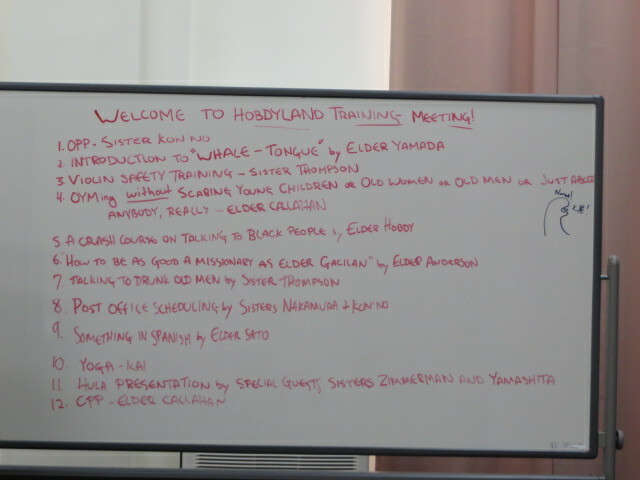 The elders are really nice, they are our Zone Leaders. I love all the people, they are super nice! Like even just regular people are nicer than people in America haha. Schmeil Choro is in my Zone. So we only see each other at zone conference and when I go on a split to Hamamatsu. I have to get off now! I’ll talk to you next week! If you fast forward to 12:45 that is about the point that Aubree is finally on with us, the other is just family talking while we wait for her. 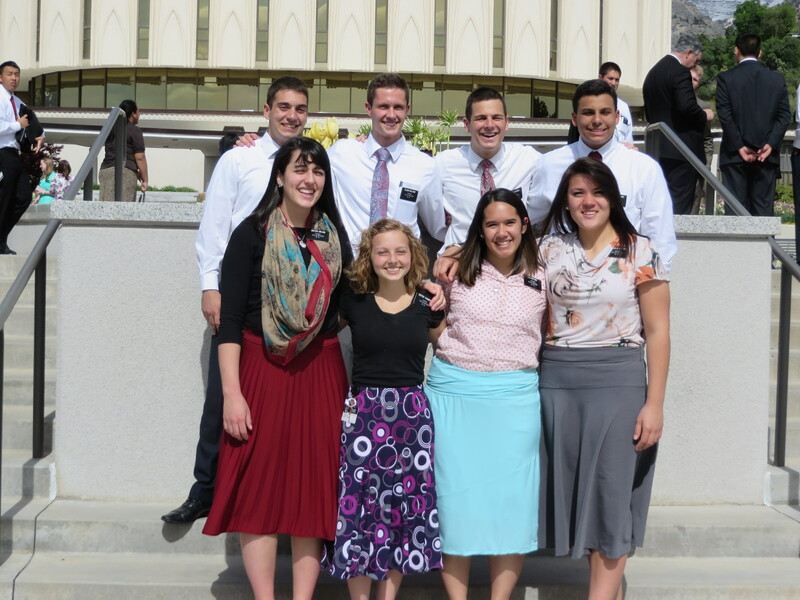 Aubree and her district at the MTC in Provo exercising. 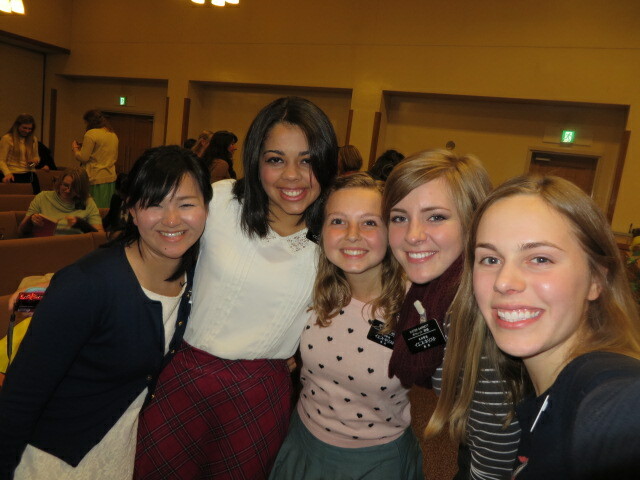 Aubree and the other missionaries from Idaho, who are in her district going to Japan. 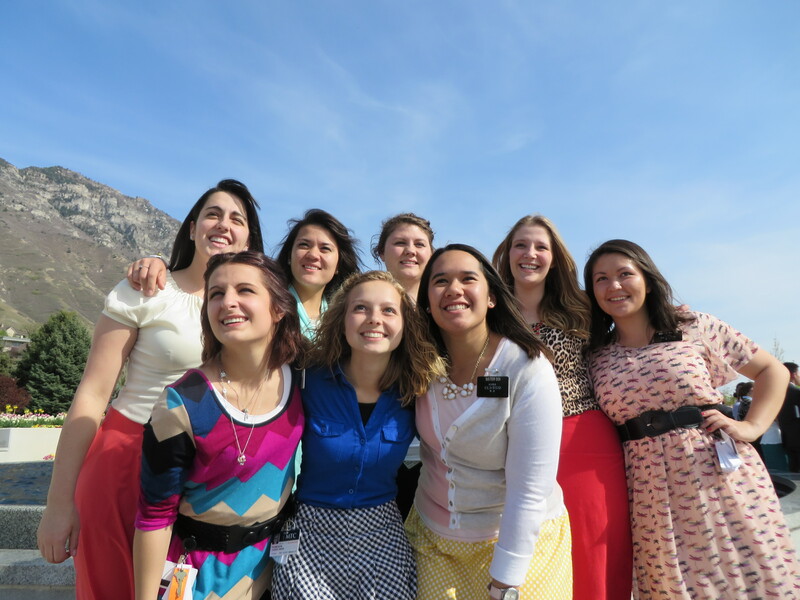 Aubree and her district in front of the Provo Temple. Aubree and the Elders messing around. 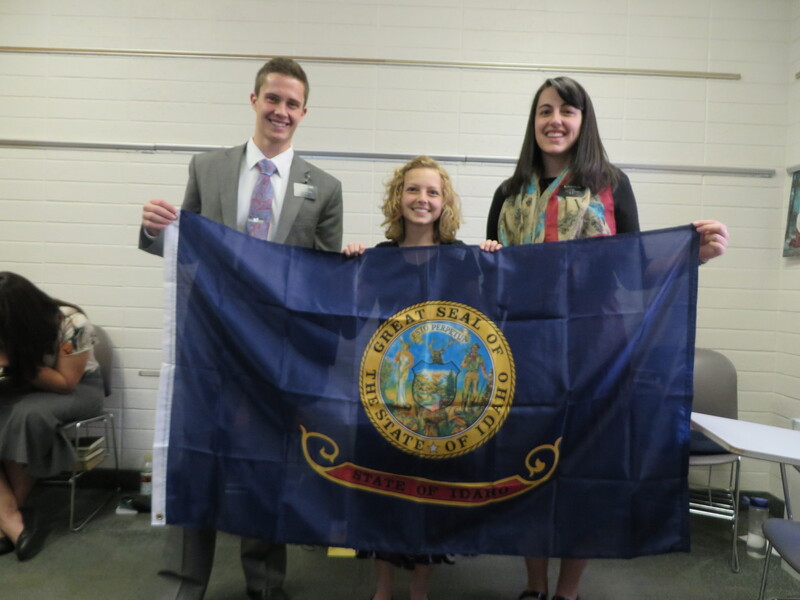 Aubree and her district getting ready to leave the MTC for Japan. 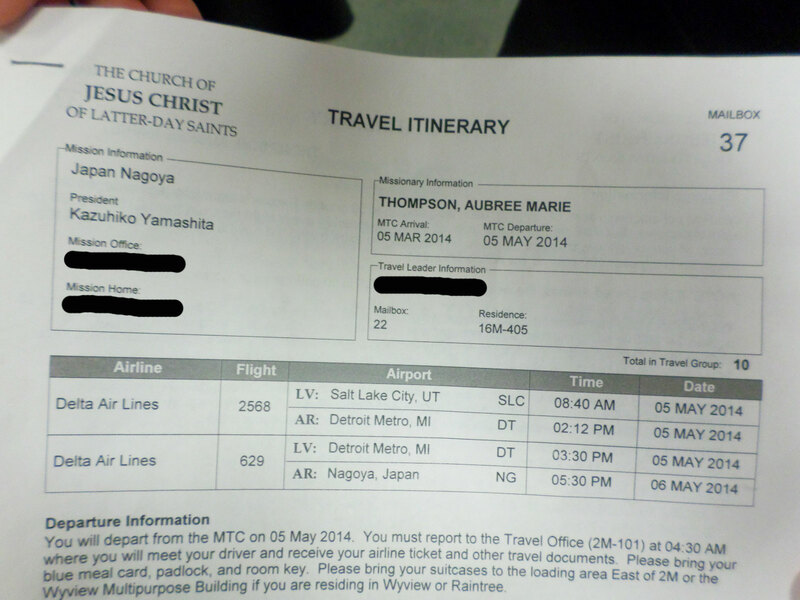 Aubree left for Japan May 5th, 2014. She left at 8:40am from the Salt Lake City Airport, stopped in Detroit for a quick layover, and the headed to Japan. She arrived in Japan 5:30 pm May 6th, 2014 (Japan time). We were able to talk to her from the airport in Salt Lake City, she called us at 6:40am. It was great to hear her voice. The first thing she said when I answered the phone was “Mommy”, in the most excited voice. 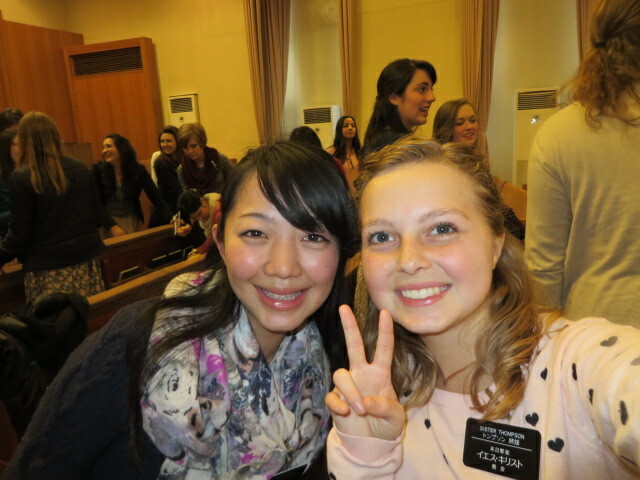 We talked for a while, and at the end she gave us her testimony in Japanese, it was amazing and you could feel the spirit. 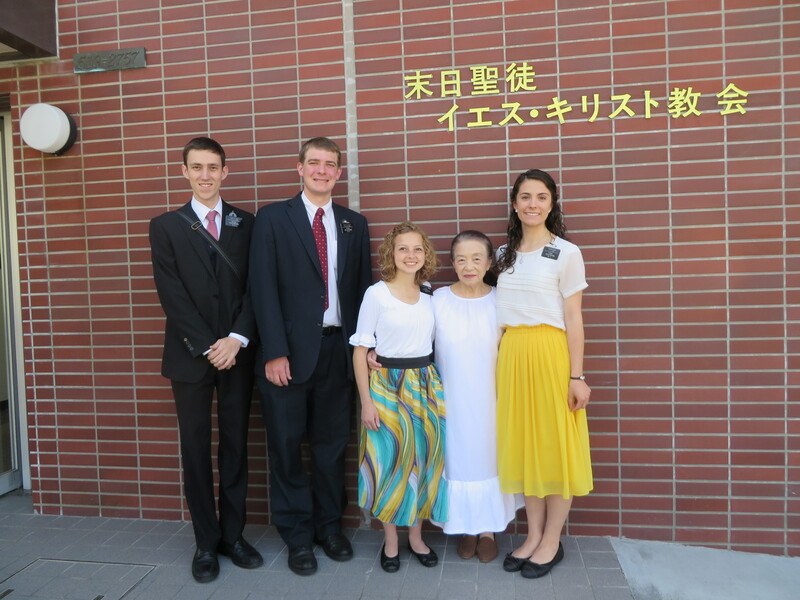 The Mission Home in Japan sent us quick note. 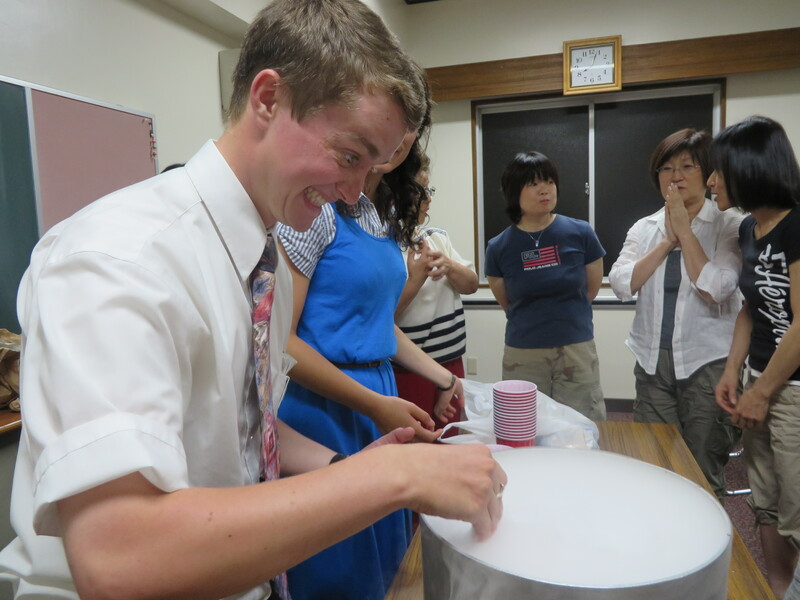 Just a short note to let you know your missionary has arrived in Nagoya Japan. Thanks for sharing them with us and for all you do. Today We received an email from Aubree May 9th, 2014 at 5:40am our time (8:40pm Japan time). We were so happy and relived to hear from her. On　my　monday at　12 (Japan time) I will be to able to do google plus. You start the group and invite everyone, and then just invite my normal account. It should be around 9 at sunday night for you guys. If I can`t get on google plus, then I will use my skype account. But I will try google first. Love you all, hear are a couple pictures of what I have been up to the past couple days!!! 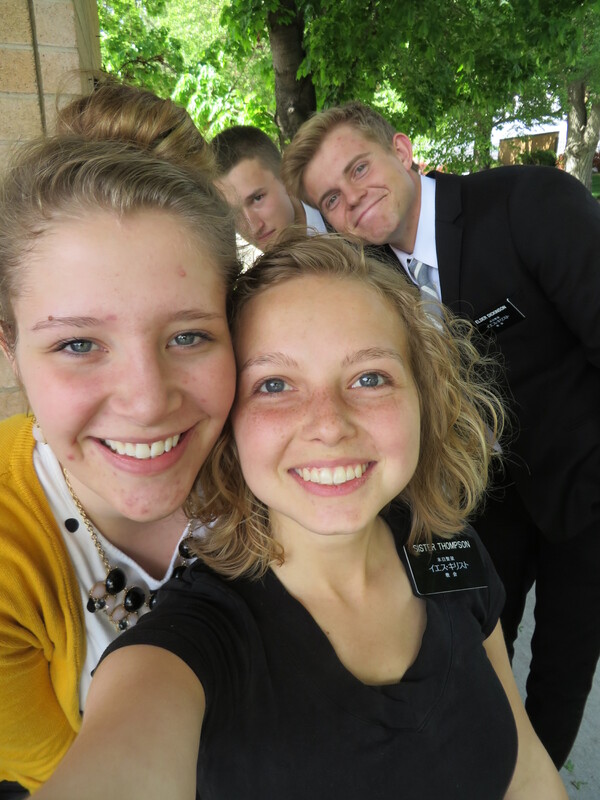 This has been the best week in the MTC so far! Easter was so amazing, I loved having the opportunity to have Easter here. It was so special. We had a morning devotional with all of the missionaries and we all took the sacrament together. Our devotional speaker was President Urchdorf! I feel so blessed to have gotten to hear him speak in person, he is one of my favorite! He talked to us about how before the Resurrection Peter was full of fear, he didn’t have enough faith to walk on water and he even denied Christ three times. Yet, after the Resurrection he had no fear because he had all his faith in Jesus Christ. I thought this talk was so perfect for me. I have been feeling a little afraid of going to Nihon and actually talking to real people. President Urchdorf told us to Fear No Man. We need to be bold but not overbearing. Overbearing is being bold without love, we need to have love for all the people. At the end of his talk he gave us all an Apostolic Blessing and it was really comforting. We thought that we would probably be done seeing Apostles because we already had two come but, on Tuesday Elder Dallin H. Oaks came and spoke at devotional. His talk was so amazing, there was so much knowledge that I gained from it. 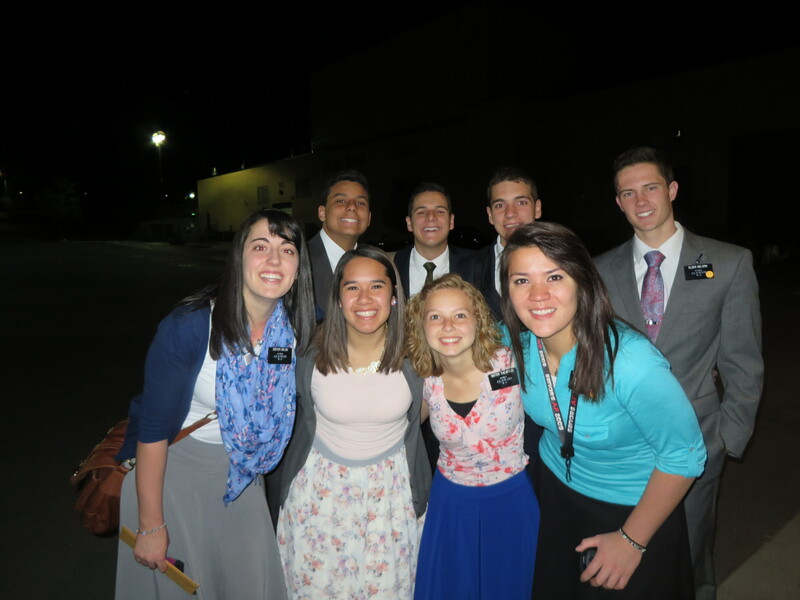 He gave us eight steps to becoming a missionary. Physical Health, Instruments in his hands, Prepare yourselves to act in his service, Remember who you are, Work to establish the church, Teach and testify, Get commitments, and Nurture. I feel so blessed to have heard from such amazing speakers. This week I have been doing a lot of running. I have found out that I actually really enjoy it. Schmeil choro taught me how to do it right. On Monday and Tuesday we did 2.6 and 2.7 miles, we were trying to do 3 but didn’t have enough time. I really hope the field is open so that I can run outside. Today we started packing and it is kind of sad, we are all so close. I have already weighted one of my big bags and I think I will be okay on weight. Today Aubree received her flight plans for her trip to Japan. Aubree’s Dad called the MTC, this is what we found out. We had questions that we wanted answers to, we tried sending an email, but it was not answered. Not sure what happened to it, but we decided the best plan of action was to call the mission home. I had a few concerns about doing this, I found the number easy enough, but should I call them? I reasoned that this was not a call into 911 that is only for emergencies, but this was more like calling 411 for information. So now I had decided to call and I had the number, but I did not even know how to call it. I use Verizon for my cell phone, we do not have a land line, so that was the obvious choice. I decided to update my Google contact with the phone number, when I did, I was reminded that I have a Google Voice phone number. I researched it and found it was much cheaper to use than Verizon. So now I knew how to call, one big concern left, I don’t speak Japanese. I struggled with this for about 15 min, how would I start the conversation? I placed the call using Google Voice on my Android phone, it rang a few times, and then I heard a voice at the other end say “Ohayou gozaimasu” meaning Good Morning (I looked that up after the call). I said “I speak English” and a comforting voice on the other end said “I speak English too”. 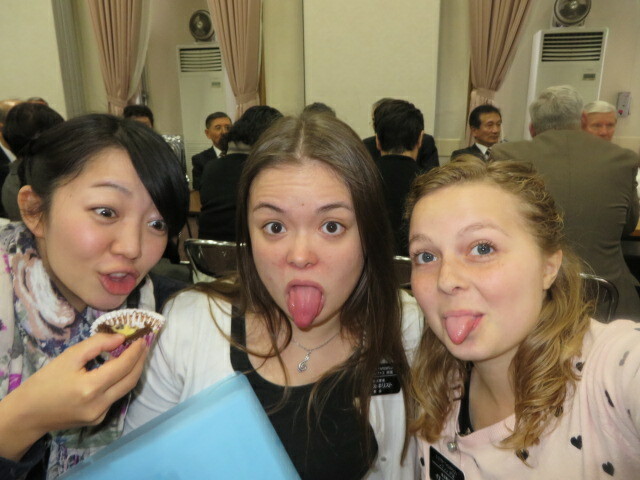 Well my prayers were answered, Sister Pincock from Kaysville, Utah, works in the Nagoya Japan Mission home. As soon as I heard her voice I was reminded about my Mother-in-Law working in the Mission Home office in Atlanta Georgia. 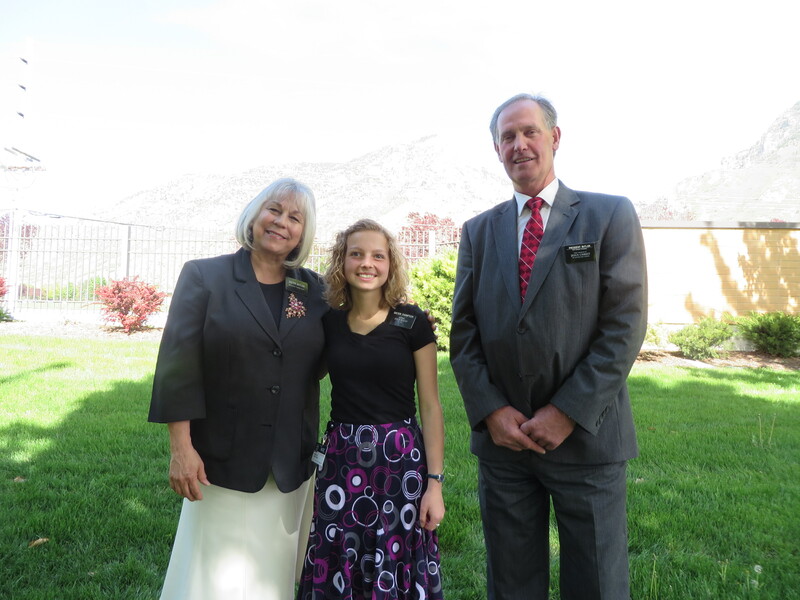 I know that she would answer lots of calls into the Mission home a few years back when they were on their mission. My Father-in-Law was in charge of the Motor pool, there is a job you never want to have, motor pool for 19-21 year old mostly Elders in Atlanta Georgia. Monday is P-day, that is when we can expect letters in the form of emails, we are so thankful for this technological blessing. 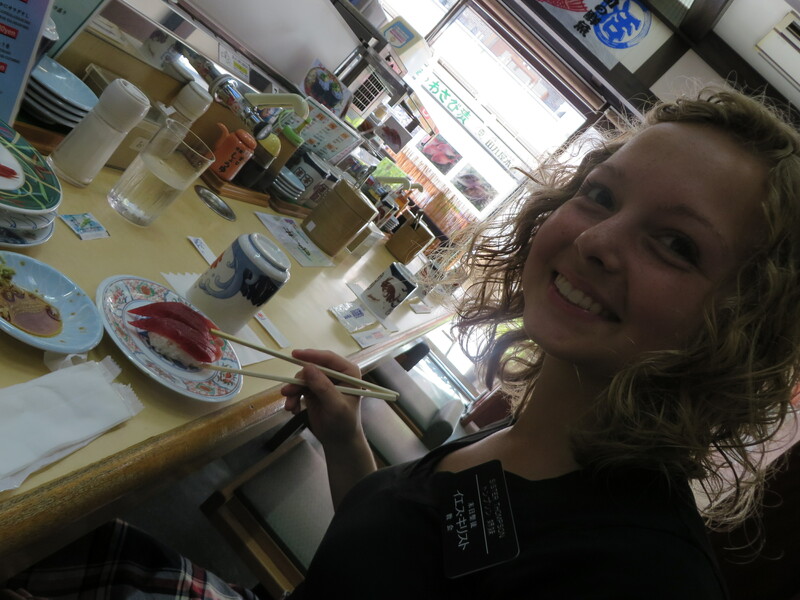 Monday Japan time will partially line up with Sunday Mountain time, it will be great to hear from Aubree. Just one more reason I love Sundays. 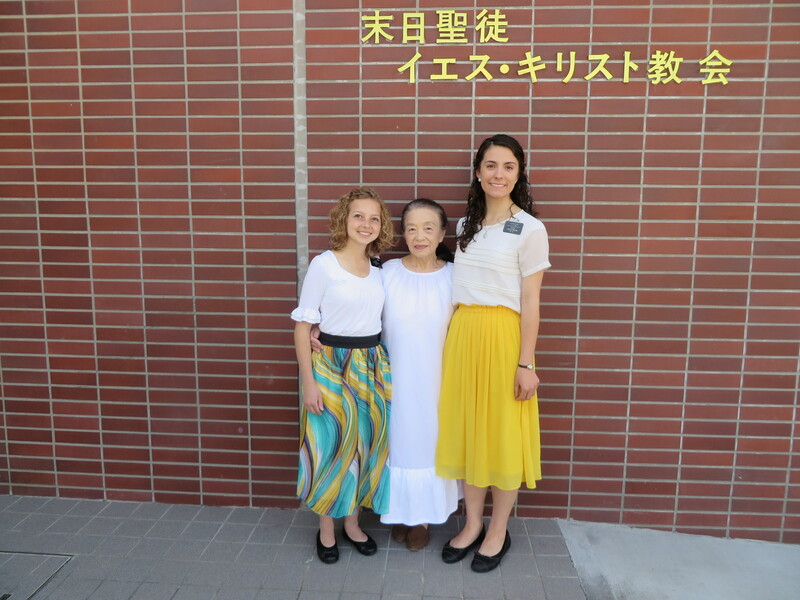 Aubree will not be the shortest missionary, one Sister just arrived that is 4’4” I believe that she is Japanese, but I can’t remember her name. We wanted to find out if Aubree could have a violin with her. 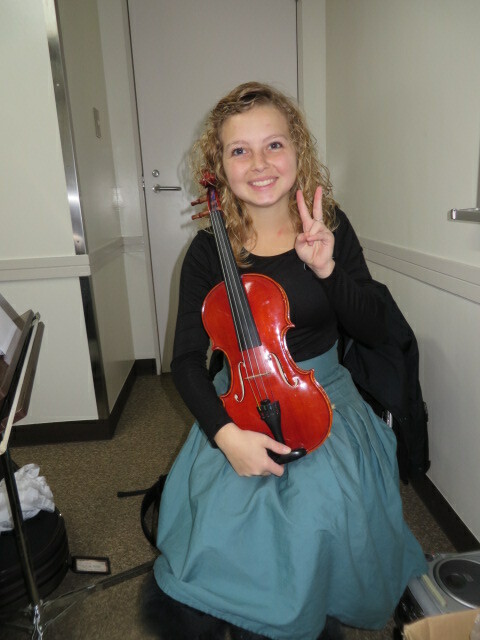 We have seen blogs of missionaries in Japan who have violins. It appears that they have been allowed to use them as tools to open doors and reach more people. 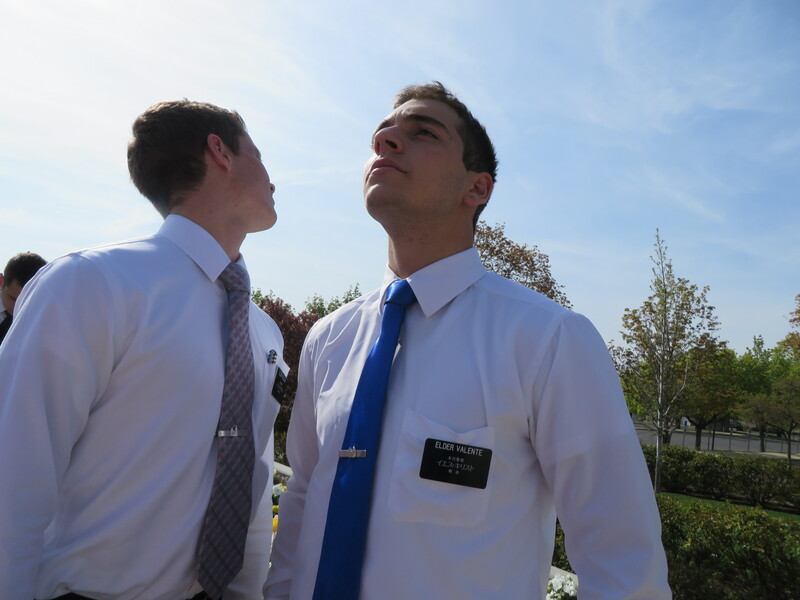 Sometimes they perform on the street while other missionaries talk to bystanders and hand out pass-along cards. Evidently the Mission Home just had a meeting in which President Yamashita had said they did not want any more musical instruments. This statement was driven by the number of Elders who have bought guitars, and spend too much time playing them. I know that hymns invite the spirit, I do not want this to be a distraction, but to be an additional method of testifying of the truthfulness of the gospel. We will happily accept his answer, as we know that he is given the mantle, and understanding of what is best for the mission. Since Aubree is short, we are worried that she will not be able to find a correct bike, I was informed that her bike will be fit to her. Not a generic bike shop that sells a handful of options, but a true bike shop that will make sure the bike is a good fit for Aubree. Evidently they have a relationship with a good bike shop every area in the Mission. Any repairs or issues will be able to be addressed at the bike shops. This was comforting, I was worried about flats she would have, and repairs that she will undoubtedly be in need of. She said these missionaries need good bikes, they live on them. Having spent some time recently here in Star, helping missionaries who bought cheap department store bikes, I couldn’t agree more. One bike I just replaced $75 in parts. He bought it for $200 less than four months ago. We talked about rain and Sister Pincock said ”Oh Brother Thompson, you should just see it here. Mothers on bikes with a baby in a basket up front and a toddler in a basket on the back. It will be pouring down rain and the mother will be holding an umbrellas over the baby as she is pedaling down the road in the driving rain. All this while she is packing groceries somewhere on the same bike. Evidently they receive a large amount of rain in Nagoya, we knew this and were laughing at the rain suits mentioned on a blog somewhere. Sister Pincock said the Sisters just wear a rain coat, and the only one she has seen wear rain pants is the Bishop, and he rides in from a few hours away. Send boots; that was what Sister Pincock said. When I asked if there was anything that I should send. I wanted to know what items missionaries have a hard time finding in Japan. She said shoes are the biggest issue, Aubree will be in luck, she wears a size 12.5 to 2 in Kids sizes, and she should have no problem finding her small sizes there. This is a big concern for us because when you look at adult shoes they are generally built to a higher standard of quality. Kids’ shoes are usually outgrown before they wear out, so the quality can be lower. We are thankful for the Japanese being small people. Shoes, specifically leather ones are charged import fee by Japan for leather. Not sure if this applies to anything else that is leather. They have heaters, they do not have furnaces like forced air furnaces we are accustomed to. They provide additional space heaters as requested for each room. 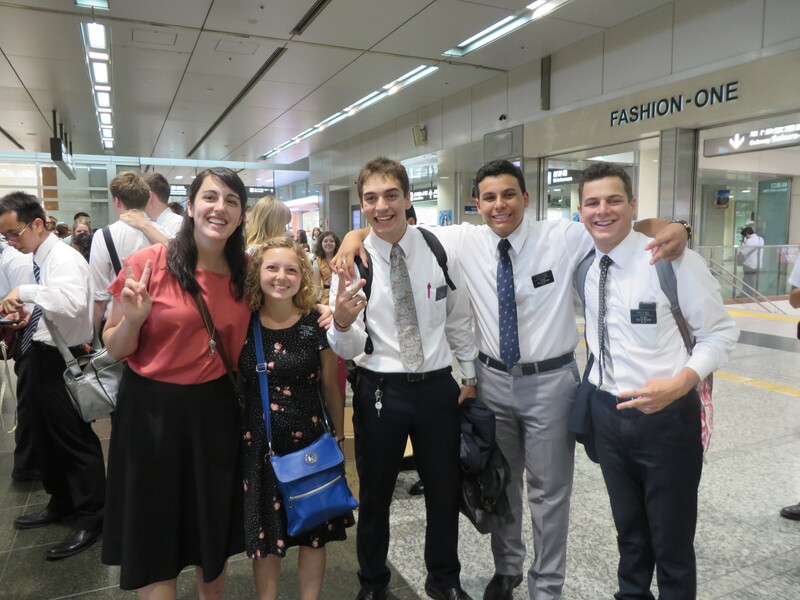 When we were talking about stores and clothes, Sister Pincock said they had lots of Malls, many more than in Utah. She said they had everything there, and that they have more than we have in the US. The mission home does not have any info, she said they know that the Tokyo mission has them. 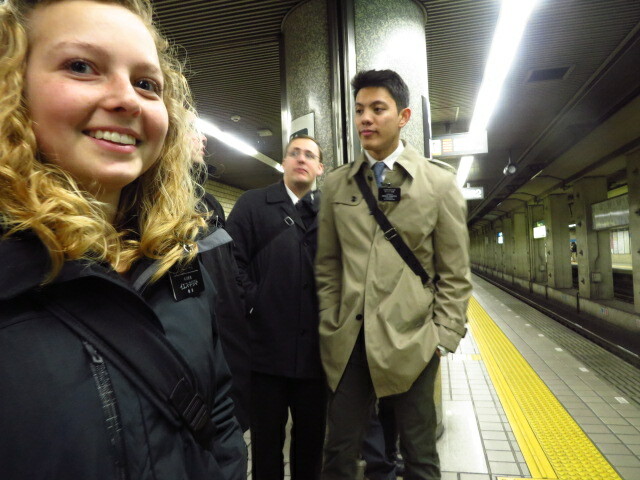 They are waiting to see how it goes in Tokyo, but she did not say they were in control of when, just that they were watching what was happening in the Tokyo mission. I let her know that we were excited at the possibility of Aubree using an IPad, it would greatly lighten her load. I say possibility because she did not say they were not getting them. We are thankful for the technology, the resources available at the missionary’s fingertips are astounding. My parents are currently serving in Fresno California, and they use a tablet with the LDS Tools loaded. What an amazing tool to be able to look at the members contact info, at the Ward and Stake level. I am not sure if it would work correctly in Japan, but in the US, clicking on a home address of a member pulls up Google Maps and will direct you there. My parents spend a great deal of time helping the young Elders with anything they need, and sometimes driving them to those member’s homes. 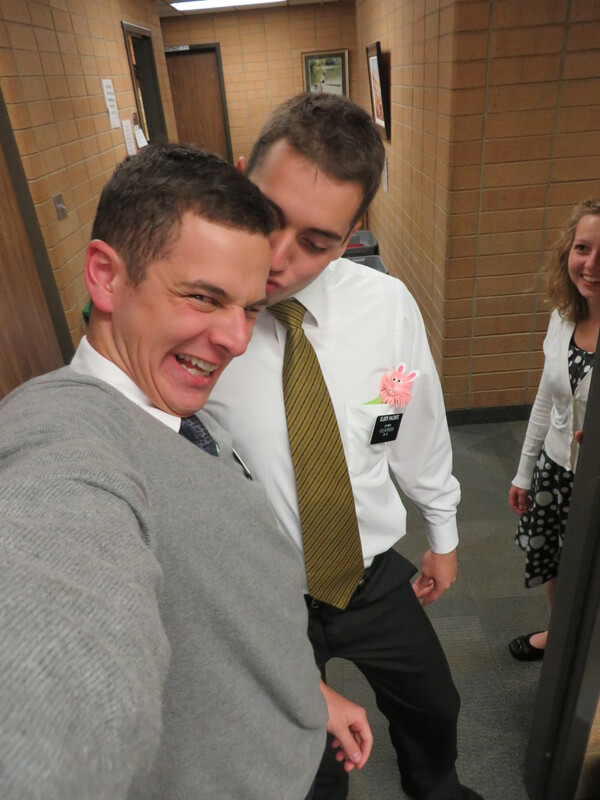 We verified that the missionaries will get to Skype on Mother’s day and Christmas. We are once again very thankful for this blessing. I am hoping that Skype is a generic term for video chat, I would like to use Google Hangouts On Air, but I am not going to push too hard on this. The benefits are multiple points of contact in the same video call, and the On Air part allows it to stream to your YouTube channel and save the recording. It can then be made private so it is not viewable by anyone else, but you can watch it over, and over, and over again until Christmas comes and you make the next one. Thank you for your call. Per our request our office phone Number is 000-000-0000 and I am Sister Pincock, my cell # is 000-0000-0000. Sister Zimmerman is the office secretary and her cell # is 000-0000-0000. 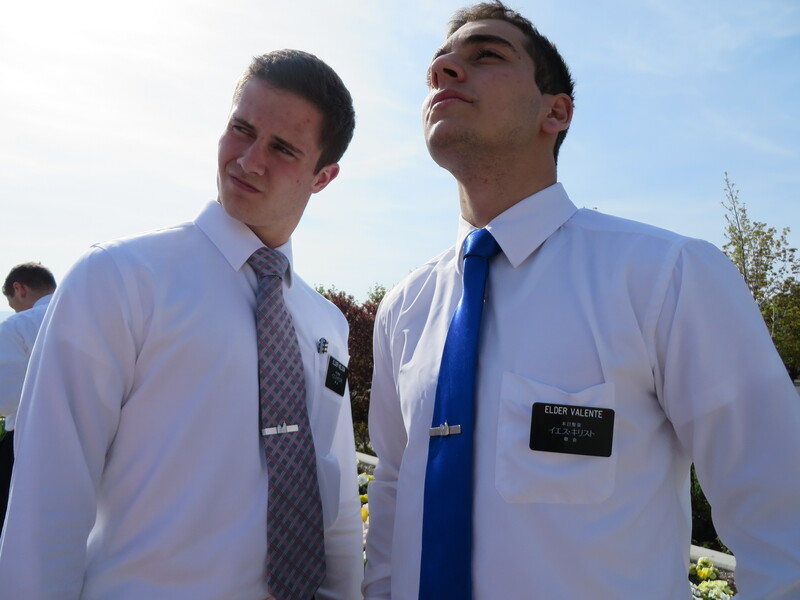 (I have the numbers, I removed them from this) We are always here to serve you and our missionaries. 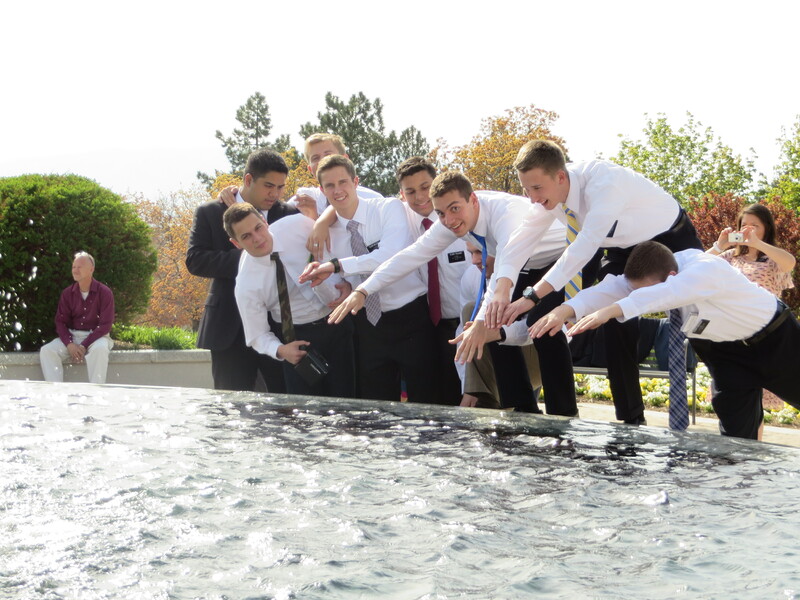 We love the missionaries and will care for them as though they were our own, for they truly become ours after spending these sacred days and months together. President is away doing interviews and is usually always with the missionaries somewhere in the mission. He can always be reached through this email or our numbers. As soon as he returns we will make sure that he has this email and knows your concerns for your beloved daughter. We are also very excited for her arrival and we will email as you as soon as we give that hug I promised to do for you. Have a wonderful day and we look forwarding to meeting you in 18 months. What a great email, she also said of President Yamashita that he is a great, kind, and loving man. I felt her admiration and respect for him in her voice. 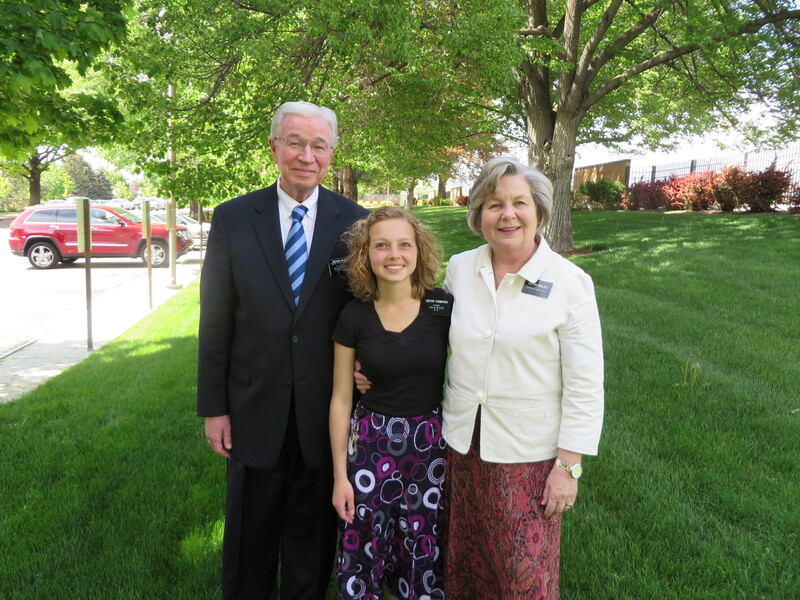 I am excited that Aubree is going to a mission with such a great Mission President. I am also truly touched at the time Sister Pincock spent with us quiescing our fears and concerns. I feel like Aubree is going to be visiting Grandma’s house and any concerns will lovingly be addressed. The comments at the end of her email, I asked Sister Pincock if she would give Aubree a hug for me. I also told her that I will see her in 17 months when we fly to Japan to pick Aubree up. I can’t wait, but I don’t want to wish it was over, I know this will be one of the greatest times in her life, therefore I do not want it to end(but I do) it is such an odd feeling. Google Voice, http://www.google.com/voice 25 min call from Star, Idaho to Nagoya Japan only cost $0.75 only $.03/min. That is comically cheap, I preloaded my Google Voice account with $10, and I still have $9.25 left. Google Hangouts On Air, https://www.google.com/+/learnmore/hangouts/onair.html have a Google account, and a YouTube account, use them both to record your video conference with your missionary.